Well what a change in the weather! When I left to go on holiday we were in very dry, hot sunny conditions and I have returned to wet, windy cool conditions! The positive is this rain will set us up nicely for the summer if it returns? The greens are quite lush and soft owing to the wet conditions and all areas are starting to grow like spring again. When the warmer drier weather returns we will be cutting crazy! Just a couple of updates on Course work. 9th Bunkers, we had to stop half way through renovating them owing to the manpower required during the very hot spell to keep the water going. It would also have been a little foolish to turf during that period. Once many of my staff have had their well earned holidays we will get back to finishing them off. We have started working on a temporary green at the 3rd hole. This is in preparation for when we install some drainage in the 3rd green on the 17th August. We will be using the same drainage system that we used on the 10th Green 2 years ago. If you remember the green was out of play for 2-3 weeks and then fully restored soon after. Hopefully things will go as smoothly as the 10th green did. I appreciate your understanding while we do this improvement works. Irrigation and reservoir plans are coming along nicely and I hope to be able to update you soon with more details. Finally , as I said earlier many of my staff are taking holidays the next few weeks, especially next week so please understand if not all jobs are getting done as quick as they should be. Enjoy your Golf, enjoy your Course. 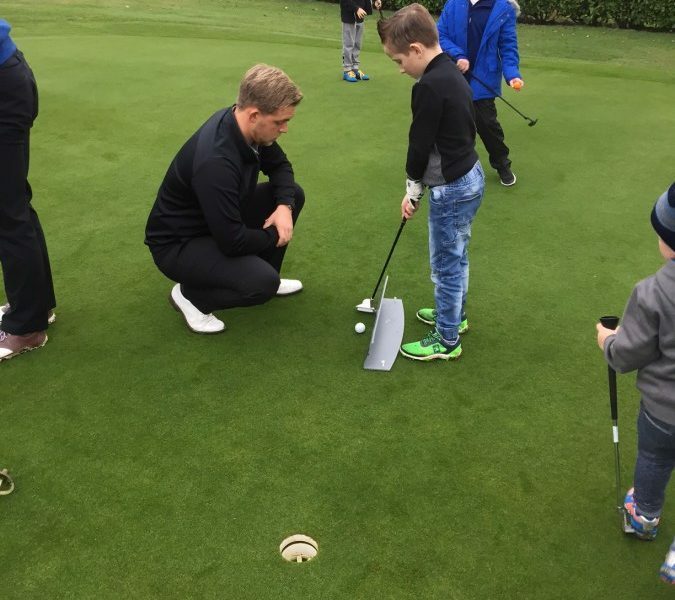 We, at Abridge, are committed to providing a wonderful golf course with top class practice facilities for all Juniors to improve their game, no matter the level they look to achieve. As a Club, we look to a successful future which begins with the younger members of Abridge. If you wish to improve your driving length, we have a golf range that even the longest hitter would have trouble outdriving. Should your short game need improving, there is a designated area that is for wedge play, whether it be 60 yards or 120 yards. To improve your putting, we have a wonderful designated putting green of the finest quality. We enter our Juniors into both the Faldo Wedge and the Essex Youth Shield competitions to give them a chance to pit their skills against the best young golfers in Essex. Should you require any further information, please do not hesitate to give our Office a call and they will gladly make arrangements for any Junior, accompanied by a parent or guardian, to come and view our facilities. I hope you are all still playing golf in between the showers. These days of continuous showers seems to have been a theme for the last couple of months. Our recent trends of warm, dry September’s and October’s seem to have gone this year. It certainly helps with keeping everything growing and looking great but does cause issues with getting ‘dry cuts’ in and course renovations. To date, renovations have gone really well. The greens as you know were only renovated 3 weeks ago and arfe almost fully recovered. Last week we managed to core and topdress all the approaches and half the tees and have finished the tees off yesterday. So despite the rain we are well ahead! The fairways will be hollow cored and or scarified w/c 2nd October and then some overseeding where necessary. The 9th bunkers are being finished this week ready for turfing, and we intend to start on re-instating the 10th bunker, again ready for turfing. We are also topping up bunkers with sand over the next two weeks. People maybe wondering what the red lines are on some of the greens? We have a few areas on the greens that after a busy summer need some overseeding. To give these areas a good chance to establish we are letting these areas ‘grow up’ to the height of the collars. Then in the spring we will re-establish the areas back to Greens height. We are also getting ready to start our Autumn / Winter programme of Tree, bunker, Tee rebuilding and pathway work. I will give you more details of these proposed works in the next few weeks. As you all probably know I raise money for charity every year. This year my chosen charities are MIND and Dementia UK and I still have approx. 12 places left on my Annual Charity Golf Day next Tuesday afternoon 12.00 sandwiches, 1pm shotgun start followed by two Course Dinner, Prizes and Raffle. If any of you would like to play or even better can enter a fourball that would be very much appreciated. Please let me know either via my mobile or the Office. Routine maintenance such as aerating and sand dressing. I hope you all have been enjoying the course over the last few weeks and were pleased with our course preparation for the club championship. The greens were left to dry out a little, apart from hand watering (hence the browning of some areas) and fairway watering was increased as you all hopefully noticed. All the green staff have heard is positive and praising comments, so from myself and the staff, a big thank you. However, to get the course in the great condition it has been over the last few weeks, we have to carry out routine maintenance such as aerating and sand dressing. On Wednesday and Thursday of this week we will be doing exactly that. Early Wednesday 12th July, the day after all that lovely rain, we aerated greens down to 5 inches with pencil tines. Sorry, the greens may have been a bit bumpy. Then on Thursday 13th July, they will then be hand cut and top dressed with a light sand dressing. Due to the dressing, the greens won’t be cut again until Sunday morning to allow the sand to ameliorate into the green profiles. Your co-operation and understanding would be gratefully received over this time. As I said earlier, up until Wednesday of this week, we had been watering like crazy in order to keep the course in great condition in the hot temperatures. This has taken a lot of man hours and the green staff’s flexibility. For this I owe them a massive amount of praise which I’m sure is reciprocated by you. As I’m sure you can appreciate, with the summer holidays imminent, we will have staff away on their holidays. During this period, we will be striving to keep the course up to the standard that it has been over the last couple of months. However, some little jobs may go amiss at times. Please bear with us as we will catch up when back up to our full quota. We’ve seen, from the start of the season this year that the course has been a lot busier with green fees, societies and corporate functions. This is only a good thing for the reputation of the club. However, due to the increase in footfall, we’ve noticed an increase in litter, pitch marks and divots not being repaired. It would be of great help from the members if these things are noticed, please pick up litter and repair damage. Until the next update, please enjoy the course. Dear all, it’s been a hot one!! Hopefully you have been out and enjoying the Golf Course. Everyone seems to be very happy with the course and greens and I would like to take this opportunity to thank my staff who are working incredibly hard and some very long hours! As you are all aware the irrigation system is planned to be replaced in September, until then we are doing the best we can to keep everything going. As fast as we fix a pipe another one seems to burst! The water bowser is out pretty much 24/7, (yes some of the staff including me have been watering through the night this week), and we will continue to do this as necessary. The ‘Travelling Sprinklers’ that you will have seen on the fairways are doing a reasonable job and again these are going most of the time. PLEASE do not touch these sprinklers or the wires they are attached to. All of this watering obviously takes up an amazing amount of manpower, some jobs are therefore having to be put back in order of priority so I hope you will understand if some things are not done. On that note thank you very much to all of you that are helping with Lol Greens’ Divot a Fairway Scheme’, it does make a difference. Well done to the Club in their achievements at the Metropolitan and I hope you are all looking forward to the Club Championships! We will be doing our best to keep the course in its best condition; hopefully we will have a little rain before then? Please note that as we prepare the course, especially the greens, for the Club Championships, we will rest certain areas so that we can bring everything up to speed, (especially the greens!!). Hope you all continue to enjoy your Course and Club. What a difference a bit of moisture makes to the course! Dear All, Well we finally got the rain !!! I hoped you all enjoyed the Captains away day, sorry i could not be there but i had an appointment with Mr. VanGerwan and Mr. Taylor last night that was an amazing experience. What a difference a bit of moisture makes to the course! All the seed and fertiliser that has been put out the last few weeks waiting for the rain has now started kicking lovely. Over the next few days we will see a massive ‘green up’ and growth spurt. We are very confident the course will keep improving now we have had some decent rain. This does mean for a few days we will have issues with grass clippings owing to wet cuts, but an issue i and the Greenstaff are happy to have ! The greens were very wet after the deluge of rain the last couple of days, and we were unable to cut them this morning. This does mean they maybe a little slow today and possibly over the weekend. Many people have been reporting that the greens have been playing great the last few weeks which is good to hear considering we have not ramped up the work on them yet. On monday the greens will be aerated, verti-cut, topdressed and fed. Please remember to rake bunkers if you go in them and to repair your pitchmarks, it really does make a difference. Enjoy your Course, its yours remember! What crazy weather we have, Who would be a Greenkeeper! What crazy weather we have! We have just had over two months of no rain and rather pleasant temperatures of 20 degrees, but as I write this it’s now May, drizzling and it’s about 10 degrees! Who would be a Greenkeeper! The weather certainly keeps us busy and stressed, hopefully, one day, we will be able to control it. We have, as promised by the club, been repairing and patching up the parts of the irrigation system we can, but that is creating in places new issues! Lol Green, Lesley Allsuch and myself have been meeting with Irrigation companies and suppliers getting everything ready for the new installation commencing August all things going to plan. More details of this once things have been decided. Just to keep you all up to date with the course. Despite being very dry we are really pleased with the way the course is coming back. The overseeding of the fairways and other areas, whilst would benefit from more rain, are slowly germinating. We have where possible carried out some watering and whilst this has not been great, now with the added rain we are experiencing things are starting to grow. We will be applying fairway fertilizer this week and the benefits will be seen once the temperatures return a little. On the subject of fairways I would like to thank ‘THE MAGNIFICENT SEVEN’ members, who generously came to help with divoting the fairways. It was brilliant to see members help to improve their course. Also to the ‘FAMOUS FIVE’ that turned up Thursday but we had to unfortunately postpone. It was a shame that a few more did not turn up, especially the few that complain about the lack of divoting at times. We have a few to finish still and therefore so nobody feels like they missed out the chance to spend a few hours with the Greenstaff!! We are having another session on Thursday 11th May, (next Thursday) to finish them off. Please let myself, Lol Green or the office if you want to help, it really is appreciated. The greens are running pretty good for this time of year and we now intend to start bringing them up to summer condition, they will receive on Monday some heavy verti-cutting, a feed followed by a top dressing. We will then commence our planned programme of little and often spiking, feeding, verti-cutting, grooming, topdressing and ironing. Lol and myself are experimenting with some different heights of cut on rough, semi rough and greens surrounds. We are now working on getting the practice green back in play and also finishing off the 9th bunkers. Hope you are all enjoying your golf and the weather warms up, but pray for a few more showers yet please! Finally it is forecast to stop raining!!! Let’s hope they are right? Thank you to those of you have been so supportive for what as far as I can remember has been one of the longest (not necessarily the wettest) spells of rain we have had for many many years. We are over 50% up on last year’s rainfall. Nearly all golf courses in Essex have been soaked; it’s very frustrating for us all. As the Captain said in his message earlier this week we are now planning the third phase of our project which is creating more suitable course conditions to play winter golf. As soon as these are agreed by the Board we will let you all know the plans. With regards to trolleys and buggies we are ‘Damned if we do, Damned if we don’t ‘ I can honestly say when myself or my staff make decisions re what can be used on the course and what cannot, we try to take everybody’s needs into consideration and what is best for the golf course. The 6.30 am answer phone we use to update conditions is very hard to get right until a course inspection has taken place. We do update the message if things change. I totally understand people’s frustrations, I am sure you can imagine how soul destroying these weather conditions have been for me and my dedicated staff. As we now hopefully start to dry out its going to take a while for us to get back to where we all want to be with the course. The grass is growing rapidly and it’s too wet to get heavy machinery out on the course. At the earliest opportunity we will be out there and my staff are ready and willing for some very long hours the next few weeks to get things right. Exciting times are ahead! The above statement is our simple remit. 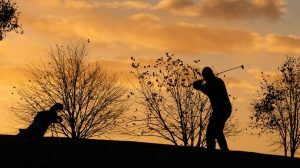 What does this all mean for your Golf Course? How do we intend to do this? Our aim, which we are extremely confident of achieving, is to return the golf course to the fantastic condition it was in during the five years of Open qualifying. There are many reasons why we believe this will be done. Some of the work has already been started, including acquiring a brand-new seeding machine, which is already being used for over seeding all fairways and bare areas. Ground conditions have been perfect and therefore we should see a fantastic improvement once the seed starts to take. We have also been working hard to improve all the bunkers on the course and are slowly bringing the new bunkers on the 15th, 17th and 18th holes into play. Not having had such a severe winter has in fact left the course with the least amount of traffic damage coming into April for many years and I believe, like many others, our greens are in the best condition in March that I have ever seen. You are all, I am sure aware, of the condition of the irrigation system, which has been failing for over 10 years. Presently over two thirds of the system are not working properly. Last year we finally got caught out by not being able to water various parts of the course and due to a long dry summer the course in turn suffered severely. We are beyond the point where we can just patch up parts of the irrigation system. Commencing early September, when the ground conditions should be best suited, we will start work on a new, full, irrigation system, including a new water efficient design, wiring, future proof mains pipework and a modern pump station. All greens, (incl. the practice 8th green), tees, approaches and at least 3 fairways will have full coverage, with the remaining fairways having pipework in place, ready for full sprinkler options for the future, should it be deemed necessary and finance allow. In the meantime, this pipework will facilitate watering the fairways by the use of travelling sprinklers. This system will make a massive difference to our golf course. Work will continue over most of the season. MJ Abbotts, our chosen contractor, have installed systems in The Belfry, Sunnindale, Celtic Manor, Royal Lytham, Hanbury Manor and The Grove, to name just a few. In the interim we will be keeping our present system going using new parts, that will in the main, be reusable in the new system. Geoff and I are working on a 1, 3 and 5-year plan for the course, which when approved by the Board will be available to all members, hopefully in the next few weeks. It will be our vision and commitment to improve and develop our great golf course over the coming years. The intended schedule of works when in place will be transparent to all. We are back to full Green Staff levels and intend to add to this. The Board have also fully committed to giving the Greens’ department the tools and investment they need to return our course to the amazing conditions that gave us our ‘Open Qualifying’ status. I am sure you will want to be part of it.